Phil Ross was a 4 year letterman for the Oregon State Beavers. 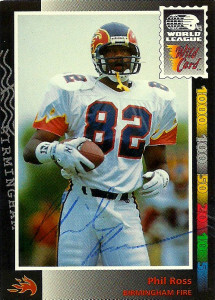 He finished second on the team’s all-time receiving list with 153 receptions for 1,827 yards, and 6 touchdowns. His biggest highlight was an electrifying 73 yard catch and go as a redshirt freshman. Selected by the Dolphins in the 9th round of the 1990 draft, he’d be cut in training camp, but fit exactly what the WLAF was looking for in young talent. Offensive mastermind Chan Gailey selected Phil with the 10th pick of the 1st round in the TE portion of the WLAF inaugural draft. 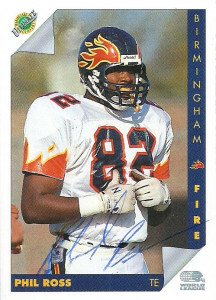 His 6’4″, 238 frame mixed right in with the Birmingham Fire‘s offensive attack and he’d pair with Mark Hopkins to give defenses fits. Based on his rushing stats, it looks like Gailey used Phil’s skill set at H-Back in addition to his normal duties at TE. Every once in a while I scour the web and hit a virtual jackpot refining my Google technique. Around the middle of 2013 I readdressed what I liked collecting and decided to return to my roots and start really going back after WLAF guys. Thanks to modern networking sites I was able to locate a host of the members of the sets I need still. I emailed Phil and he was kind enough to accept and sign these cards for me. He also attached a nice note, and thanked me for updating him on the status of many of the members of the Birmingham Fire squad. Phil currently works in the mortgage industry in Washington.